Known as a creator of evocative dances that reflect her concerns about the human condition, Dorfman is interested in creating “worlds” into which the audience can enter. 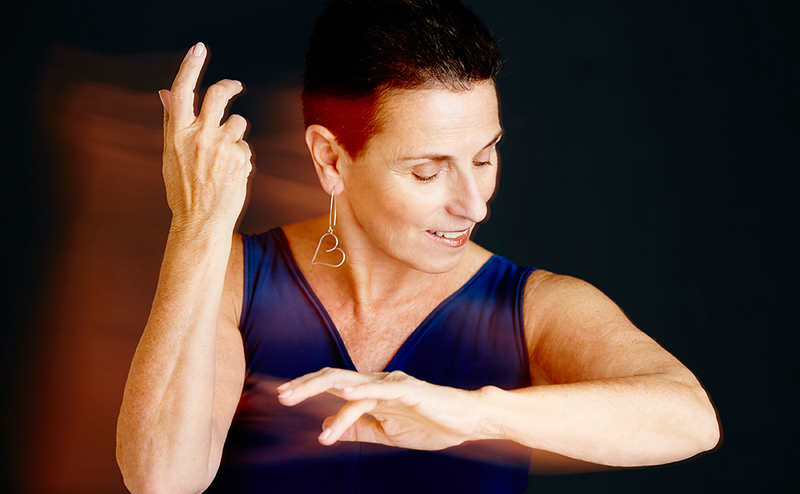 Carolyn Dorfman, choreographer and founding Artistic Director, Carolyn Dorfman Dance is known as a creator of evocative dances that reflect her concerns about the human condition. She is interested in creating “worlds” into which the audience can enter. Hailed as the consummate storyteller, Dorfman, a child of Holocaust survivors, has also created a celebrated body of work that honors her Jewish legacy; its trials and triumphs, its treasured uniqueness and, most importantly, its universal connections. Her interdisciplinary and intercultural approach on the stage and in the community explores the rich tapestry of human experience, tradition and stories. Touring nationally and internationally, her eleven-member, multi-ethnic company, appears at major theaters, festivals, universities and non-traditional performance venues. Carolyn Dorfman Dance presents immersive performance and teaching residencies that take the company into diverse communities to share art and process that can build connection and understanding. From Houston to Detroit, Miami to Omaha, Carolyn Dorfman and Company see dance as a vehicle for social action and change. Multiple tours to Poland and Bosnia and Herzegovina have been supported by The Trust for Mutual Understanding, U.S. Arts International and the U.S. State Department, all valuing the art and programming that builds human connection. In 2018, Carolyn Dorfman Dance commissions the creation of a new work featuring a ground-breaking collaboration between Artistic Director Carolyn Dorfman and formerCarolyn Dorfman Dance company member and Co-Artistic Director of the internationally renowned Pilobolus, Renée Jaworski. Merging their signature styles and processes, Dorfman, Jaworski and the 11 dancers of Carolyn Dorfman Dance come together to create a work about connection; past, present and future.Carolyn Dorfman Dance will exclusively tour the work, which will premiere at NJPAC on April 14, 2018, for two years and it will then join the touring repertory of Pilobolus. This is the first time in the history of Pilobolus that a work that will join their repertory has been created on another dance company. A Michigan native, Dorfman received her BFA in Dance with certification to teach grades K-12 from the University of Michigan and her MFA from New York University Tisch School for the Arts. A former Assistant Professor of Dance at Centenary College in NJ, Dorfman is a master teacher, mentor, and a guest artist/choreographer/lecturer at major universities, pre-professional and professional training programs across the U.S. and abroad. A former artist and member of the board of the Yard and ArtPride NJ, she is currently on the Artist Committee of the All Stars Project NY/NJ and a member of their NJ Board of Trustees. She is a mentor for Dance USA’s mentoring program and is an Honorary Co-Chair of NJPAC’s Celebrate Dance Advisory Committee. Dorfman and the company lead the Dance Division for NJPAC’s Arts Education Program and she is a resident artist, guest choreographer/teacher and mentor at leading pre-professional training programs in the U.S.
Honored with many artistic and civic awards, Dorfman has been designated a Distinguished Artist and has received six Choreography Fellowships from the New Jersey State Council on the Arts. She received the Prudential Prize for Non-Profit Leadership, the Jewish Women in the Arts Award for Dance from the JCC of Metropolitan Detroit, was named the Industry Partner of the Year from the Union County Vocational Technical School/Academy for the Performing Arts (2012), received the Dance Advocate Award by DanceNJ (2013), was named a “Woman of Excellence” in the Arts and Humanities by the Union County Board of Chosen Freeholders/The Union County Commission on the Status of Women (2014), and received the Humanitarian of the Year Award from Seton Hall University and The Sister Rose Thering Fund (2015). In November 2017, she is the featured cover story in the Dance Teacher Magazine entitled “Making Dance a Dialogue” and in December 2017 she was featured in “ON THE SCENE with John Bathke” on News 12 New Jersey.